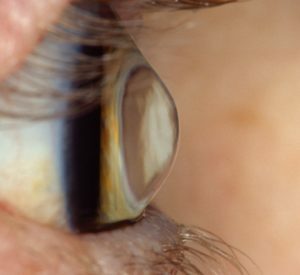 Corneal topography is a computerized test that generates a three-dimensional image of the surface of the cornea, the clear tissue at the front of the eye. Normal eyes have an evenly rounded shape to the cornea like a beach ball, while abnormal corneas can be too flat, too steep, or irregularly curved. Corneal topography is most useful for the detection of corneal disorders such as keratoconus that are otherwise difficult to diagnose with other testing methods. It can also be useful in fitting contact lenses. For cataract surgery the corneal topographer uses Wavefront Analysis to determine which specific lens type is best for a patient, how to best position that lens in the eye, and to ensure the absence of irregular patterns of curvature that could create unpredictable outcomes. When the test is used to diagnose keratoconus or other corneal diseases, corneal topography is covered by OHIP. When it is used for planning cataract surgery lens selection, it is not covered by OHIP.